« What Do You Care About? I launched a new project this week. 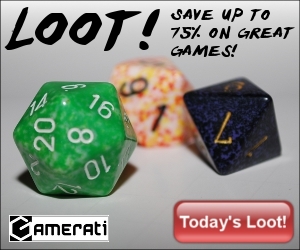 Called Loot, it’s a deal-a-day site focused on games and game-related products. In addition to helping with customer acquisition / social proliferation, Loot is also a way for me to test marketing theories. Week 1 is done. This is what I’ve learned. The first thing you should know about Loot is that I didn’t do it on my own. I had the help of Josh Dalcher, who I met via his gaming blog. We worked on a couple projects together, during which I came to know him as a competent coder and a professional. Those two skills – competence and professionalism – must go hand in hand when you’re looking for people to work with. They can be the best at what they do, but if you spend more time waiting for things to get done or restating project specs because they don’t know how to follow instructions, you’ll wish you’d never met them. Similarly, the people you work with need a requisite level of skill in order to make the relationship work. In short, I’m lucky to have found Josh. He’s Gold. One of the first tactics I’m testing with Loot is the use of banner advertising. I have two goals here: to test click-thru-rates on my Gamerati Ad Network (PDF) and to learn what types of ads work best. We made three sets of ads. Each set included a leaderboard (728×90), a rectangle (300×250) and a skyscraper (160×600). One set focused on card games, one on board games and one on roleplaying games. After our first week of stats, the results speak for themselves… viewers click on ads that have dice on them. Our best performing advertisement was the RPG rectangle (below), which pulled a 0.48% CTR. But all the ads that had dice did very well, each netting a 0.22% CTR or better. In the past, I’ve been a big fan of Go Daddy. They have decent prices and they have 24-hour customer service. However, they proved to be inadequate for me this week. We had our first Loot sale 8 minutes after we went live. Twenty minutes later… the site crashed. During the nearly six hours it was down, I spoke to two customer service reps and one technical specialist. None of them could help me. In veritable despair, I started poking around on my server blindly… and fixed the problem on my own. (NOTE: I know nothing about servers or internet protocols, etc.) The Go Daddy people were cordial and patient (professional), but knew next to nothing about their own product. The fixes they proffered not only didn’t work, but broke some of the other services I had on my server as well (incompetent). Needless to say, I’m looking for a new hosting company as soon as I have the time. I guess you could say that Go Daddy was not Gold. That wraps up my thoughts on Week 1 of Loot. As I have more thoughts, or learn more lessons, I’ll make sure to let you know about them. This entry was posted on Monday, March 21st, 2011 at 12:00 and is filed under Featured, gamerati, social media. You can follow any responses to this entry through the RSS 2.0 feed. You can leave a response, or trackback from your own site.